The Copa America 2016 gets underway in the early hours of Saturday morning for those of you here in the UK, when hosts USA face Colombia in the tournament opener.. The Copa America is one of my favourite tournaments to watch with its end to end football and at times, lack of defensive quality…. Although in fairness the tournament plays host to some of the best attacking players in the world in Messi, Suarez & Aguero. It is also a great tournament for us to have a bet on and I have looked into all the stats and picked out my top 5 bets for this years tournament. They are the tournament favourites and I think quite rightly so, they possess the best attacking options and have got much stronger defensively for this tournament. They enter the tournament on good form and only have Chile as a threat in the group stage so should quality to the latter stages with ease. For me they are the most likely winners this year. My dark horse for the tournament this year are Ecuador. I think they have the players required to get through the group stage alongside Brazil and once there could be a match for any team in the latter stages… Whilst I think they might struggle if they get one of the big boys in the final, 1/3 odds on them reaching the final, I’ll take that! Whilst most people will likely be betting on the likes of Messi, Aguero or Suarez to be the top goalscorer at this years tournament, I have gone for a more outside shot.. Gabriel Barbosa is a 17 year old striker for Brazil, who plays club football at Santos… He is very highly rated and is tipped to be the next big thing from Brazil. He scored his first goal for Brazil in his debut in a warmup game this week and I am expecting him to burst onto the scene at this tournament… Expecting him to hit a few against Haiti in the group stage. It is always fun to try and pick the winners of each of the four groups at the tournament and I think the odds of 9.81 for these selections is very good. Colombia appear to only have strong competition from hosts USA to win group A and I fancy them to beat the hosts in the opening game and claim that group. Brazil should have very little trouble in winning their group, with their only likely threat being Ecuador. Uruguay appear to have the hardest job as they face tough competition from Mexico, but Uruguay should have more than enough defensive strength to win their group with Luiz Suarez doing his thing at the other end of the pitch. Argentina are the tournament favourites and they have Chile to battle for top spot in the group… For me they are the strongest team so should handle the group stage well enough to top their group. I will be back Colombia to Win and Both Teams To Score in the opening game! 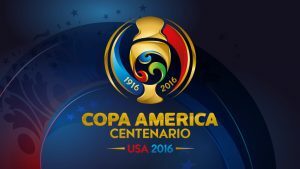 These are my top 5 bets for the Copa America 2016…. Feel free to share your best bets in the comments section below….